Susanne Barrett: Shakespeare Family Workshop Now Underway! Shakespeare Family Workshop Now Underway! Brave Writer's very popular Shakespeare Family Workshop at Brave Writer is now underway, but there's still time to join in the fun as a few spaces remain in this interactive workshop class. 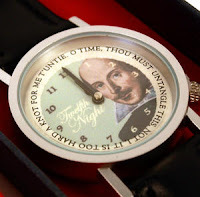 Shakespeare is one of my very favorite topics, and I am definitely a Shakespeare fan girl; above you'll see an image of my wristwatch. My loving husband gave it to me for this past Christmas, and I wear it every single day. So come on and join the fun as we study Shakespeare in a fun and interactive way for the whole family! Recommended for families with students age 9-18. I hope to "see" you online! You may register for the class here: Shakespeare Family Workshop.